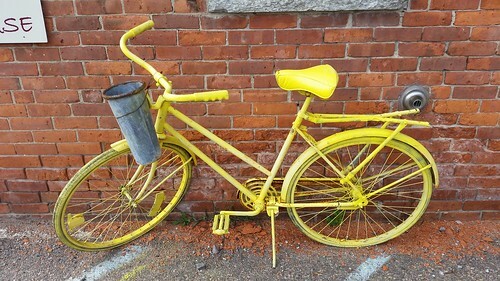 A bicycle painted entirely yellow. Another oddity at the flea market that I stumbled upon. It begs the question, "why paint a bike yellow?" but more so, why paint it yellow and add a bucket to the handle bars, right? But there the bike was, just sitting there with no price tag or indicator of an owner. It was just an artistic statement of "Here's a yellow bicycle--figure it out yourself!" I was surprised that there was air in the front tire but not the rear and I wonder what it would have been like to ride it if it could have been ridden. Not that I expected it to ride differently, but more what would the experience of traversing about on such a strange yet common object.